Elise is as sweet and girlish as any daughter could be. It's a joy to have her by my side (frequent costume changes notwithstanding). 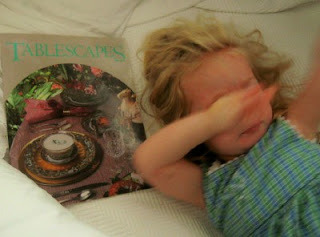 But even I had to laugh when I saw her choice of naptime reading: an old copy of Tablescapes , swiped from my bookshelf. I suppose I should round up some books to build her character, not just her place setting ability! Looks like a little girl after my own heart! That's hilarious! At least she has good taste! Ah, she is her mother's daughter. How precious! She will really be ahead of the game when it comes time to make her own beautiful home. She is such a doll! I'm always on the lookout for those character building books for Brenna, too. The True Princess is a good one. The illustrations are colorful and pretty (just a little...Modern? for my tastes, but Brenna loves them) and the story is lovely - all about developing a servant's heart. What I'd like to find are books with old-fashioned values built in. Allegories can seem a little heavy-handed, ya know? Sorry, didn't mean to go off on a tangent in your comments box! Yep, me too. My four year old likes to take one of my issues of Architectural Digest (I've loved it for years but only recently subscribed for the first time because I got an UNBELIEVEABLE rate!) to bed with her and "read" it, which thrills me...I love seeing little girls begin loving the things that will someday help them to be good mommies and homemakers. Elise is beautiful, Meredith. She's sure to be a wonderful helper with the new baby! How funny! I remember reading my mom's Better Homes and Gardens gardening books when I was growing up.